Two weeks ago, I began the vision design story of War of the Spark talking about how we got the Planeswalker theme in the set. Last week, I introduced my Design team and talked about how proliferate finally returned. Today's column is the third and final part of my story. I'm going to be talking about how we captured the war part of the Planeswalker war. I'll walk through a mechanic we didn't use and then explain how we created amass, the last mechanic in the set. I'll end by showing off a preview card with the amass mechanic. I hope that sounds fun. Let's get started. I've talked about how we saw War of the Spark as an "event set," meaning our goal was to focus the design less on the environment and more on the event unfolding. As such, I began vision design intent on finding a mechanical way to make an event set feel a little different. On top of that, I wanted to bring a sense of the stakes being raised as this was the final chapter of a three-year story arc. I bring all this up, because a big part of the story of War of the Spark vision design is the journey down a path that we ended up abandoning. In the past, I've been a bit shy to talk about mechanics that didn't work out because I always have faith that we'll find a way to redeem them and use them in the future. My worry in talking about them is that I'll lessen their excitement if we do find a way to do them. After much reflection, I've come to the belief that the audience knowing about the failure of the mechanic in the design only fuels their desire to one day see us do it. With that said, it's time to talk about skirmish. I often talk about how Un- sets allow us to play around with ideas that black-border Magic isn't quite ready for yet. One of the things Unstable let me do was experiment with an external component that got overlaid onto the game. (I'm talking about Contraptions.) This external component has its own function, but it creates some kind of output that interacts with the game. You spend time and energy building your Contraption, and then it spits out effects that influence how your main game plays out. There are numerous different ways to do this, one of which we explored in War of the Spark vision design. The idea behind skirmish was that we wanted there to be a battle between you and your opponent. This battle would be overlaid onto the game and would generate effects that affected the game. The second technology that skirmish used was first seen on the Monarch token in Conspiracy: Take the Crown. This uses an external card as a game piece that outlines its own rules. The cards that generate the Monarch token don't tell you what to do, it just generates the game component which then explains itself. Skirmish would do the same thing, which was to generate a Skirmish token, meaning any card with the skirmish mechanic would have "create a Skirmish if one hasn't been created yet." The Skirmish token had a tiny "game board" on it showing a field of combat. When you performed one of the stated conditions, you advanced on the field toward the opponent's side. If you advanced enough, you won the skirmish. You would do this because there was a payout for winning, a generated effect. Skirmish went through a lot of variations with a lot of different advancement conditions and a lot of different payouts. The other most commonly used advancement condition was the casting of a card with skirmish. This was important because the first skirmish card you played started the skirmish sub-game, but we wanted later cards to be relevant to encourage you to want to play a bunch of skirmish cards in your deck. (One of the problems we had was this made skirmish a little more linear than we'd intended.) We also went back and forth on whether you advanced one for the playing of the first skirmish card. This helped offset wanting to play the card when the opponent had a chance to earn a free effect. Most of the time we had a third advancement condition. We tried damaging players with spells, but that rewarded red too much. We tried playing Eternals/Zombies, but that also only rewarded certain colors. We tried playing multiple spells in a turn, but that didn't thematically feel right. The one that felt best was advancing when you caused an opponent's creature to die, but this complicated processing combat damage. I just want to note that we spent months on skirmish and experimented with many variables. The other big thing that changed a lot was the output of the winning the skirmish. Part of the time we had either player earn the effect if they won, but also tried a version where only the person who generated the skirmish token got an effect. In that version, the opponent wanted to win to stop them from getting it. What the effect was for winning and how big it was shifted over time as we tried to balance them. We also experimented with a version where there were small rewards along the way and a bigger reward for winning the skirmish. We had a lot of interesting ideas how we could use various skirmish cards as a way to show off major moments of the war. We even talked about having various different skirmish cards to choose from. At one point, we had players going in order through a certain set of skirmish cards that represented the different stages of the war in the story. In the end, what killed skirmish wasn't that we didn't like it or that it wasn't fun, but it didn't capture the essence of what we were trying to do with the set. (Also, there were a host of play design issues that needed to get solved.) We spent a bunch of time on it, but eventually I realized it had taken us down the wrong path, so we started experimenting with pulling up the Planeswalker theme. Before moving on, I do want to note that an important part of vision design is to explore ideas that sometimes don't work out. If you're afraid of abandoning work, it keeps you from exploring the more out-of-the-box ideas that can often lead to major breakthroughs in Magic design. Once we abandoned skirmish, I knew we still had to find a way to capture the sense of war in a set all about war. Also, we had to solve the problem of the Eternal army. We were making a lot of planeswalkers, but the majority were going to be fighting against Bolas. 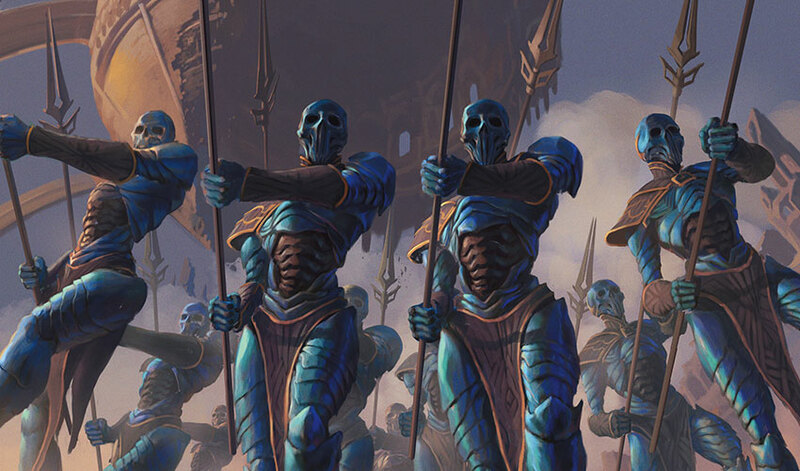 The largest chunk of Bolas's army was going to be the Eternals, the lazotep-coated zombie soldiers from Amonkhet that Bolas brought to Ravnica with use of the planar bridge from Kaladesh. We'd actually thought about this all the way back in Hour of Devastation design. We'd spent a bunch of time coming up with a mechanic that we'd put on the Eternal army and then bring back when Bolas brought them to Ravnica. (We knew this was a story point back in Amonkhet block design). It was our intent to use afflict in both Hour of Devastation and War of the Spark, but then something happened—two things actually. One, R&D soured a bit on afflict while making Hour of Devastation. Afflict's design space was smaller than we expected; it proved hard to balance in volume, and it warped the set in ways that weren't ideal. Two, you all didn't like afflict as much as we hoped. It wasn't hated or anything, but it wasn't the kind of mechanic that many were going to be cheering for its return. On top of all that, it wasn't really synergistic with what the set was doing. For example, in a heavy planeswalker set, you want to be able to damage the planeswalkers, but afflict was about players losing life. (For example, if afflict had been designed for the first time in War of the Spark, it would have dealt damage to a player or planeswalker if blocked.) It just wasn't a great fit. That meant we needed to come up with a different take on the Eternals. I knew we wanted a mechanic for them, so we set out to find something new. This feedback led to the earliest version of the amass mechanic, Army creature tokens. Here's how they worked. Amass (originally called "conscript" in design) was a keyword action that could generate Army creature tokens. The mechanic had a number with it to tell you how many tokens it generated. The Army creature tokens were 1/1 with the ability "you can't attack or block unless all Army creature tokens you control that are able to attack or block do so." The idea was that these creature tokens were an army and had to work together. If one of them attacked, they all had to attack (save any with summoning sickness, as they couldn't attack). If one of them blocked, they all had to block (although they could choose to block whatever creature they liked if the opponent attacked with more than one creature). This resulted in them playing very different from a normal collection of 1/1 creature tokens. For example, let's say your opponent has a 5/5 creature and you have four 1/1 Army creature tokens. Normally, you could use those four creature tokens to chump block the 5/5 over four turns. With the Army creature tokens, you could only chump block once because if the opponent attacked with only the 5/5, you had to either block it with all four of the 1/1s or none. Likewise, on attack, you couldn't attack with some of the army leaving the rest back for defense. If you attacked with any of them, the whole army attacked. The gameplay was flavorful and unique, so I was optimistic that we'd found our solution. And then Dave Humpherys spoke up. While the "attack or block" together solved some of the gameplay issues with having a lot of small creature tokens, it didn't solve all the problems. The biggest one remaining was how powerful it made team-boosting effects. The nature of the extra planeswalkers already made blocking a little tougher than normal, and Dave was concerned that it would be very hard for Play Design to balance. He asked if we could come up with a different solution for the Eternals. He gave us this note during the final month of vision design (War of the Spark was the last set with a six-month vision design; "Archery" would be the first with a four-month one), so we didn't have a lot of time to find a solution. Often in game design you have a very complicated problem to solve. Looking at all the components can be very daunting, so a technique I like to use is to break the problem into smaller chunks of bite-size issues. You start by solving one issue and then slowly bring in other issues one by one. Metaphorically, I compare this to cookie making. Every December, my family hosts a holiday cookie party centered around these sugar cookies that I love. The recipe calls for four cups of flour. If I poured that into the mixer all at once, it would gum everything up, but, if I slowly add the flour a little at a time, my batter can handle the influx of flour. I'm going to use this technique to demonstrate how we solved amass. Bite-size problem: We need an Eternal mechanic for the set. Solution: The Army creature token version of amass did a great job of capturing the feel of the Eternal army. It was a bunch of individuals coming together as a single entity. No soldier went off on their own. They all worked together. This was even more important for the Eternal army because they lacked free will. They worked together because there was no choice but to work together. Bite-size problem: While the army functioned as a single entity, from a game standpoint, each was its own creature, which allowed for team boosting that was hard to balance. Solution: Okay, what if the army was considered one creature from a game standpoint? What if amass didn't add creature tokens to the battlefield but +1/+1 counters to an existing creature? Bite-size problem: The flavor didn't work though if those +1/+1 counters weren't all going to the same creature. Solution: What if there was an Army creature that the +1/+1 counters had to go on? Bite-size problem: Then you create an A/B problem where the deck needs to first get out an Army before you could amass it. Solution: What if the amass mechanic made the army? What if it created an Army creature token when the effect happened? You put out a 0/0 Army creature token that you put +1/+1 counters on. Bite-size problem: The end result is a bunch of Army tokens of various sizes. Even if they have to attack and block together, it doesn't quite solve Dave's issue. Also, we have proliferate in the set. Having too many creatures with +1/+1 counters might result in us removing it from the set. Solution: What if there could only ever be one Army creature token? What if amass made a 0/0 Army creature token only if there wasn't one under your control. (Note that this solution was inspired by how skirmish had worked, so while the mechanic didn't make the set, it did have a little influence on one that did make it in.) Otherwise, it just adds +1/+1 counters onto the existing Army creature token. This way it will work with proliferate, but only to ever gain one counter. Now that was an interesting idea. We playtested with the new version of amass, and it did exactly what we wanted. It matched the general feel of the Army creature token version in that it felt like a single unified army, but it being locked to one creature solved the team-boosting and proliferate issues. We finalized this new version one week before the set handed off from Vision Design to Set Design. Although they tweaked the numbers, Set Design didn't change amass—with one exception. 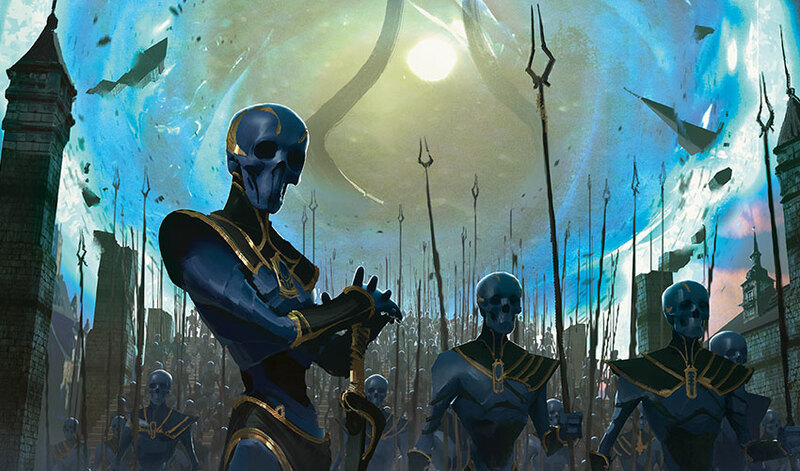 Instead of just being creature type Army, it was changed to be a Zombie Army as Hour of Devastation had clearly established that the Eternals were Zombies. There was also some talk about what color the Zombie Army should be. 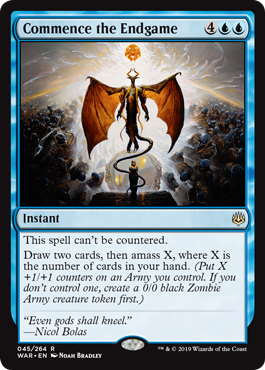 The final two choices were mono-black (as that's the home of Zombies) or blue-black-red (to capture that the army was Bolas's, as those are his colors), but Set Design ended up going with mono-black as it was simpler with less words. The set didn't really care about colors, so the Eternals not being blue or red didn't mechanically matter. Now that I've explained how we got amass, it's time for my preview card with amass. It's a fun and flavorful one. I'm curious to see how big of an Army all of you will be able to create. That's all the time I have for today. I hope you enjoyed learning about the mechanic that never was as well as the origins of the amass mechanic. As always, I'm eager to hear your feedback on my column, War of the Spark, or the amass mechanic. You can email me or contact me through any of my social media accounts (Twitter, Tumblr, Google+, and Instagram). Join me next week when I'll start my card-by-card design stories from War of the Spark. Until then, may you have much fun waging war.